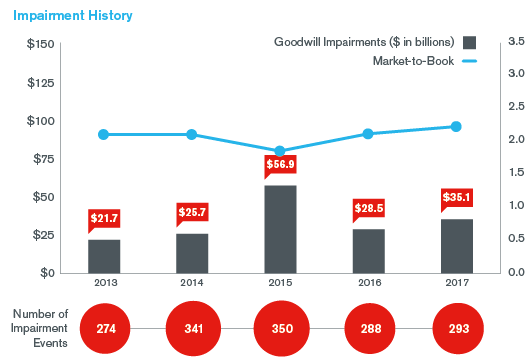 But goodwill impairments are on the rise, having climbed 23% in 2017. Nearly $319 billion of goodwill was added to U.S. companies’ balance sheets during 2017, the highest level since 2008, according to the latest Duff & Phelps U.S. Goodwill Impairment Study. That reflected a robust year for mergers and acquisitions. But that abundance of goodwill was accompanied by a rise in goodwill impairments, the charges companies record when goodwill’s carrying value on their financial statements exceeds its fair value. Impairments climbed 23% in 2017, to $35.1 billion. And the size of the average goodwill impairment event rose 21%, to $120 million. For 2018, Duff & Phelps is projecting a similar trend. “The top three goodwill impairment events disclosed thus far have neared $30 billion, with several other material impairments already being reported,” stated Greg Franceschi, managing director and global leader of Duff & Phelps’ financial reporting valuation practice. “This trend points to yet another significant increase in the overall goodwill impairment amount” in 2018. Of the 8,433 publicly held companies that Duff & Phelps studied, 36.3% of them were carrying goodwill on their balance sheets in 2017, and 9.6% of those recorded a goodwill impairment during the year. Seven out of the ten industries analyzed saw their aggregate goodwill impairment amounts increase in 2017 – with energy and information technology being notable exceptions. The consumer discretionary sector was the hardest-hit industry and has represented an increasing share of overall goodwill impairments for three years in a row. “Now that economists and market analysts are predicting a slowdown in economic growth, this may place further strain on the industry in the months ahead,” according to the report accompanying Duff & Phelps’ data. The top 10 goodwill impairments in 2017 came from Frontier Communications ($2.7 billion), General Electric ($2.6 billion), Liberty Expedia Holdings ($2.2 billion), Windstream Holdings ($1.8 billion), Dentsply Sirona ($1.2 billion), Community Health Systems ($1.4 billion), Discovery ($1.3 billion), Liberty TripAdvisor Holdings ($1.3 billion), Envision Healthcare ($1.0 billion), and Lincoln National ($0.9 billion). All of those impairment charges were dwarfed by the $22 billion accounting hit General Electric took in the third quarter of 2018. That impairment was the biggest impairment charge (of any type) for a U.S. company since ConocoPhillips wrote off $25 billion of goodwill from its balance sheet in 2009. In the five years from 2013 to 2017, the companies Duff & Phelps studied added $1.05 trillion in goodwill to their balance sheets and wrote off $145 billion. Duff & Phelps noted that of the companies recording the top 10 largest goodwill impairment events in 2017, 8 of them had already adopted the new simplified test of goodwill impairment, codified under Accounting Standards Update 2017-04.